The best independent insurance agency in Wheeling, WV, Moundsville, WV, St. Clairsville, OH, New Martinsville, WV and throughout West Virginia, Ohio and Pennsylvania. Paree Insurance Centers is your trusted independent insurance agency in Wheeling, WV, Moundsville, WV, St. Clairsville, OH, New Martinsville, WV and throughout West Virginia, Ohio and Pennsylvania including Ohio County, Marshall County, Wetzal County, Brooke County and Belmont County. From our start in 1996, the sole focus of Paree Insurance Centers has been to provide our customers with “The Best Combination of Price, Protection and Service” while always being the trusted insurance authority in the Ohio Valley for our personal insurance, business insurance and employee benefits clients. We work with a wide variety of individuals and businesses in Wheeling, WV, Moundsville, WV, St. Clairsville, OH, New Martinsville, WV and throughout West Virginia, Ohio and Pennsylvania, specializing in Auto Insurance, Home Insurance, Business Insurance, Individual Life Insurance and Individual Health Insurance. To provide our clients with the Best Combination of Price Protection and Service. We will represent Quality Insurance Carriers that offer comprehensive products at affordable prices while providing customer service that exceeds expectation. Our staff will always place the best interest of our policyholder first. We are committed to being the most trusted insurance authority in our community. At Paree Insurance Centers, we have a licensed staff of 26 customer service agents and producers servicing the needs of our clients in West Virginia, Ohio and Pennsylvania. Our staff makes it a point to know your world inside and out and are there to help you through all the changes in your life and your business. Erie Insurance Quality Agency Award Winner. Erie Insurance 2017 Founders’ Award Winner. 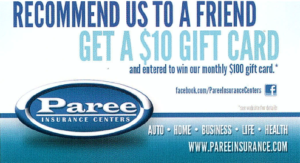 At Paree Insurance Centers, our mission is very simple. We strive to provide a true, concierge client experience which is unique in the insurance industry. We give clients the power of choice from top-rated national and regional insurance carriers. We offer comprehensive insurance solutions in Wheeling, WV, Moundsville, WV, St. Clairsville, OH, New Martinsville, WV and throughout West Virginia, Ohio and Pennsylvania including Ohio County, Marshall County, Wetzal County, Brooke County and Belmont County.